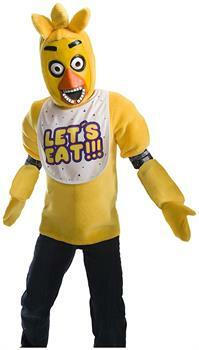 Bring your child's favorite video game to life with this girl's Chica Costume. Featuring Chica's tooth-filled beak, yellow body, and bib that reads "Let's Eat," she'll look just like the killer animatronic chicken! Put on the Chica mask, yellow plush tunic, and the large mittens, and she'll be ready to prowl the night in this Chica the Chicken costume for girls! Pants not included.